One of the biggest mistakes you can make as an online shopper is sticking to the same old favourite stores. Why? Because some of the best offers in town are often the ones given out by new or less popular stores in order to lure new customers. These relatively new stores may not have the funds to run TV ads but they do know exactly how to attract customers. So, here we bring you eight of the best lesser-known online fashion stores currently giving the highest cashback on Zingoy. If you know a shopaholic friend who might like any of these stores, create your own Zingoy links for each of these stores and share it with them. If they make a purchase using your links, you will earn cashback on it. In its own words, Faballey is a place for ‘taste-makers and trend-breakers’. If you are the kind of person who is comfortable in their own skin and does not worry too much about what is trending and what is not while shopping fashion, this is the online fashion store for you. What makes it even more perfect is that Faballey is currently offering you a whopping cashback of Rs 356.25 on all orders above Rs 500 bought via Zingoy. This is the highest cashback you will find in the fashion category. So grab it now, as this offer expires in 12 days. Ladies, if niche and premium is your thing when it comes to fashion, Kazo is the place where you will find it. Kazo also has 21 physical stores in the major fashion hubs of the prominent cities in India. Here, you will find western wear, bags, belts, wallets, clutches, bracelets, necklaces, hairbands and rings. Also,, Kazo is offering you cashback of Rs 330 on all orders above Rs 330 bought via Zingoy for the next three months. Launched in October 2015, Aditya Birla Online Fashion brings you freshest styles and celebrity-inspired outfits, shoes, and other fashion accessories at affordable prices. 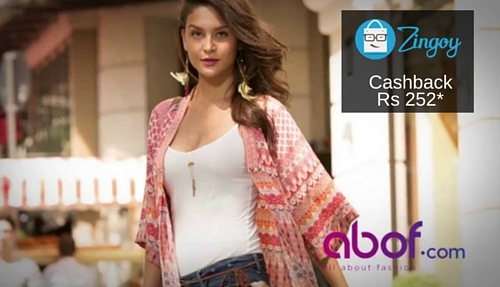 If you buy anything priced more than Rs 300 from abof via Zingoy, you can earn cashback of Rs 252. This one expires in five days. The best way to buy the perfect lingerie is online. Here, you can browse all you want from the privacy and comfort of your home, without feeling uncomfortable. Also, here you will find that the sizes are more standardised as compared to your local stores. Thus, you get lingreie that not only looks perfect but also fits perfectly. Another reason to shop your lingerie online is the great discounts that you can grab, and the cherry on top is cashback! Pretty Secrets, one of the leading online lingerie stores, offers its customers a cashback of Rs 370 on all orders above Rs 500 ordered via Zingoy. Not only that, Pretty Secrets also offers Zingoy users up to 20% cashback on orders below Rs 500. The deal is on for another two months, so hurry! Apart from lingerie, Pretty Secrets also brings you nightewear, swinwear, gym clothes as well as fashion apparels. The second highest cashback on lingerie comes from India’s pioneer lingerie store, Zivame. 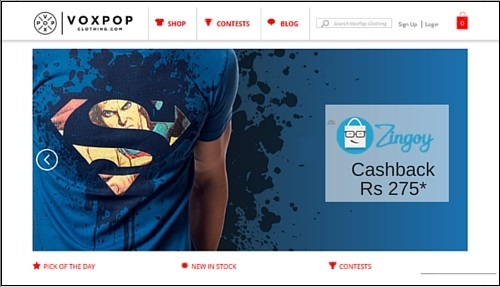 This online store awards a cashback of Rs 205 on all products priced between Rs 301 to Rs 800, purchased via Zingoy. Whereas all orders below Rs 300 can fetch you a cashback of up to 22% through Zingoy. Here, too, apart from intimate wear, you can shop for active wear, comfort wear, swim or beach wear and accessories like gloves, lingerie bags, pantyhose etc. In existence since 1986, Biba is one of the most loved brands by Indian women when it comes to contemporary ethnic fashion. Be it kurtis, patialas, salwar suits, lehengas, ethnic skirts, tops, leggings etc, Biba has a wide range of vibrant and delightful designs to offer. On the other hand, Zingoy offers you Rs 280 as cashback on any thing that you buy from Biba for more than Rs 280. This offer will last for about next two months. As the name suggests, Voxpop is a place where you will get poular culture on your clothes, accessories, shoes, and even toys and collectibles. Here, you will find tees, sweatshirts, sweaters for men and women, shoes, bags, keychains, wallets, mobile covers, laptop skins, shoes and various other fashion accessories with themes and prints of comic characters, fantasy creatures, popular TV series or any other trending celebrity. So, go ahead and indulge that fan in you while Zingoy gives you a cashback of Rs 275 on all Voxpop clothing above Rs 275 bought via Zingoy. Puma is one of the world’s leading brands for sports footwear, apparel and accessories. You will find the best sports-inspired lifestyle products here, under categories like running, training, football, cricket, motorsport etc. To make it a little more affordable for you, Zingoy offers you a cashback of Rs 250 on all Puma products bought through us. Stay up the good work! You understand, a lot of people are hunting around for this information, you could help them greatly. I think your spot on with this post. That is so good to know about! Thanks a bunch for the informative and educational post and tips!